After weeks of first fighting talk and then stony silence, Yahoo has at long last made a move to escape the takeover clutches of Microsoft. The company has announced a two-week experiment during which it will show search-driven Google adverts alongside the search results of Yahoo's website. At the same time Yahoo is reportedly talking to rival internet portal AOL about a merger. 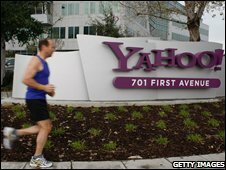 Some analysts have described Yahoo's manoeuvring as a "really clever move". Excited investors rewarded the company with a 7% rise in its share price. However, they are sadly mistaken. If anything, these moves are proof positive that Yahoo is standing with the back against the firewall of its internet servers. When Yahoo rejected Microsoft's $44.6bn takeover bid (now worth a tad less following the stockmarket gyrations), it did so arguing that the offer seriously undervalued its earnings potential. Good things were to come, said Yahoo's management, outlining a three-year strategic plan and promising "new products and... actions which leverage our scale, technology, people and platforms". Earlier this week, when Microsoft set Yahoo's board a three-week deadline to agree to the deal or face a reduced offer, Yahoo trumpeted a new advertising management platform, called AMP!, that would help transform the business. In reality, though, Yahoo has simply failed to deliver. A year ago the company launched with great fanfare "Panama", the latest version of its search marketing service. Advertisers don't seem to have taken a lot of notice. Yahoo's former arch rival Google continued to extend its lead in the lucrative market for search advertising. The fact that Yahoo is now trying out Google's search algorithm to deliver adverts is an acknowledgement that its own paid search model is broken. Yes, even Google's ad clicks have fallen recently, but that appears to be the result of a deliberate move. The number of ads on each search results page has been reduced, because Google wants to deliver advertisers fewer but more valuable clicks. Too many adverts are not quite relevant to the search. Offering adverts that better fit the search should result in happier searchers and higher conversion rates - where the click on the advert actually results in a sale. Do you hear that rustling sound? It's the noise of competition watchdogs around the world whipping out their notepads to add up the search market share of both Yahoo and Google. For paid search the combination of Google and Yahoo would control more than 90% of the market. No regulator worth his or her salt will allow such a combination, not least given the fact that online advertising is a rapidly growing market place. 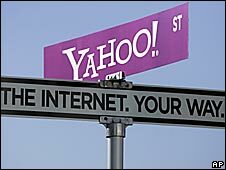 There is just one way for Yahoo to escape the loving, albeit suffocating, embrace of Microsoft. If the advertising experiment with Google is a success, Yahoo can prove to potential suitors that its online properties - and the millions of eyeballs that they attract - are still highly valuable. However, it would also prove that Yahoo is struggling simply because it has been badly run. 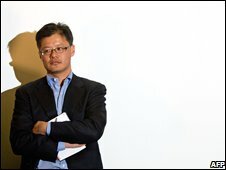 Has Yahoo lost its way? And it would put the firm into a very awkward position. Yahoo thinks of itself as a technology company. And indeed, the firm stands on two legs - its media and its technology operations. But if Yahoo can only be truly successful by using Google's search technology, then the firm would start to resemble a hiker that has become trapped under a boulder. Struggling to break free, the hiker realises that in order to escape and survive he has to amputate one of his limbs - in Yahoo's case a key part of its technology division. It would be a bloody and painful affair. At the end of it, Yahoo would be a mere media company. That's not a bad thing, but it would not sit well with Yahoo's image of itself. Microsoft's bid, in contrast, is centred around combining Yahoo's and Microsoft's technical expertise to compete with Google. That doesn't mean that a combination of Yahoo and Microsoft can succeed - far from it. But the latest manoeuvrings demonstrate just how desperate Yahoo's situation has become.